Does the US/China Emissions Deal Make a Difference? Recently the United States and China agreed to a carbon emissions reduction deal to combat global warming. Under the terms of the deal, the US agrees to reduce emissions by 26% to 28% from 2005 levels by 2025, while China agrees to reach peak emissions by 2030, and to generate 20% of its energy with zero-emissions technology by that year. Diplomacy is notoriously difficult, and consequently any deal on climate change heartens those who watch international politics. But are these emissions reductions sufficient to avert the worst of what global warming potentially has to offer? I’m not seeing much coverage of the deal from a climate science perspective, so I decided to look into it. The National Academy of Sciences details what is likely to happens based on current research if the globe continues to warm. The effects are relatively manageable provided warming is less than 2 degrees Celsius. Above 2 degrees, a serious risk of coastal flooding sets in for many highly populated areas. For this reason, scientists generally advise states to attempt to limit the warming to 2 degrees. 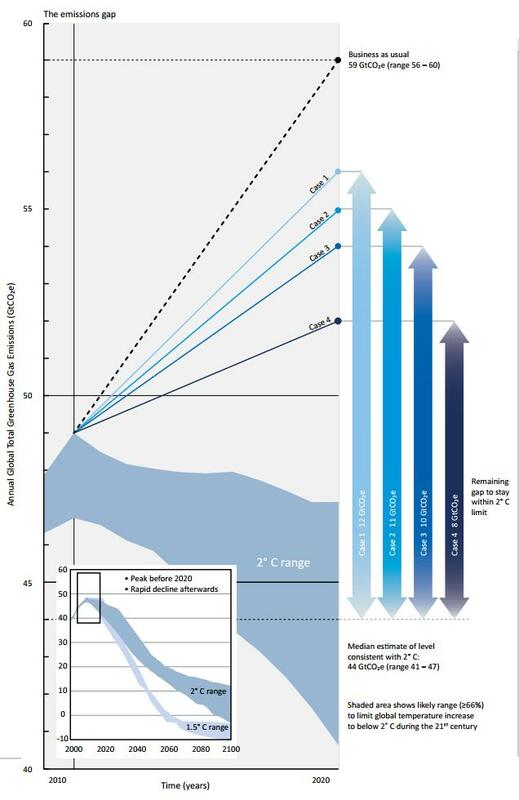 This is not to say that warming of less than 2 degrees will have no impact (even warming less than 2 degrees will substantively change rainfall figures in many regions, reduce crop yields, and submerge island nations like the Maldives), but it is expected that these impacts will be within the manageable range for most countries. The United Nations Environmental Program (UNEP)’s 2013 Emissions Gap Report details what will be necessary to keep the temperature rise below 2 degrees. It estimates that if we are to have a chance of achieving the 2 degree target without having to rely on as yet undeveloped carbon capture technology, emissions in 2020 will need to be no higher than around 44 gigatonnes. This is a problem, because in 2010, we were already emitting 50 gigatonnes, and UNEP estimates that unless additonal substantive reductions are made, emissions will reach 59 gigatonnes in 2020. See “OECD North America”? That’s the US, Canada, and Mexico. Together, those three countries are 14.5% of global emissions. If we adopted some extremely generous assumptions and presumed that the US controlled 100% of that 14.5% and that the 28% reduction target was from current levels rather than 2005 levels, the emissions reduction the United States has agreed to would be no more than 1.8 gigatonnes by 2025. In the meantime, while the Chinese have committed to a 20% zero emission energy target, they are not promising to reduce their total emissions until 2030. 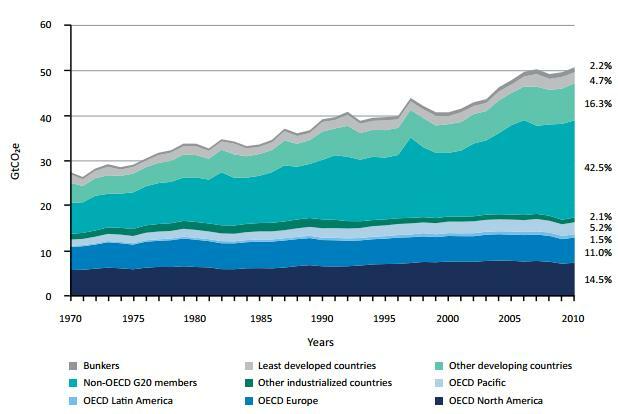 China is part of the “Non-OECD G20 members” group, which produces 42.5% of emissions. That group contains Argentina, Brazil, China, India, Indonesia, Russia, Saudi Arabia, South Africa, and South Korea. Under the agreement, China’s commitment is not stringent enough to result in any emissions reductions before 2030, and the rest of the countries in its category are not part of the agreement. So the US/China agreement certainly does not solve the problem. Why then, are so many political commentators hailing it as historic? There are several reasons. For one, most people who pay close attention to politics do not pay anywhere near as close attention to climate science, so many of them are not aware of the scale of the problem. There is also a long tradition in international politics of overstating the significance of agreements because of how difficult it is to achieve anything at all by diplomacy. An agreement of any kind is usually far more than most observers have been expecting. Some are aware but are nonetheless optimistic that this agreement will open the door to other larger, more comprehensive global agreements. The trouble with this line of argument is that it’s very hard to see any likely agreement emerging in which developing countries like China commit to emissions reductions prior to 2030–these countries still have large numbers of deeply poor people, and their governments rely on economic growth to secure their political legitimacy and stability. UNEP’s data shows that the highly industrialized countries already account for only 34.3% of total emissions (all the OECD groups plus “other industrialized countries”). Even if the entire OECD cut its emissions in half by 2020, this would only amount to roughly a 15% reduction–about 7.5 gigatonnes. Given that UNEP projects 59 gigatonnes in 2020 under current policy, a 7.5 reduction would still leave global emissions at 51.5, well above the 44 gigatonne target. Any realistic path to 44 gigatonnes seems to necessarily require that developing countries reduce the pace at which they develop to some degree. For this reason, even in UNEP’s most optimistic scenario (see “Case 4” in the first image), in which states adopt “higher-ambition pledges” with “strict accounting rules”, we still end up with 52 gigatonnes in 2020. After 2020, the demands of UNEP’s trajectory only intensify. This does not mean that all reductions to carbon emissions are necessarily futile (even if we do not hit the 2 degree target, 3 degrees would be better than 4, and 4 would be better than 5), but it does mean that a solution will have to go beyond what states are likely to agree to through conventional diplomacy. In the absence of any higher authority above states, there is nothing to compel them to abide by their pledges or to follow strict accounting rules. Consequently, all states fear that the pledges are insincere and that other states will attempt to free ride. This encourages states to refuse to make ambitious pledges and to engage in spotty pledge enforcement. There’s little prospect of a change in these structural incentives–no international organizations are likely to gain the coercive power necessary to police the pledges effectively. For this reason, it’s likely that combating global warming will require carbon capture technology and improvements and innovations in clean energy generation. We should be concerned not only with states’ emissions commitments, but with the amount states are investing in these technologies and in scientific research more broadly. If China and other countries are going to continue industrializing until at least 2030, we will need cheap, efficient, clean energy technologies that will enable that development to be less malign than it is currently projected to be, and insofar as we are unable to do that, we will need carbon capture technology to rollback the clock and buy more time. Reblogged this on Outering Road. Interesting post. I agree, the outlook is looking pretty grim at this point. I recently started working a job though where I’m in touch with a lot of organisations and companies in the global renewable sector and there is hope there, wind and solar are becoming much more viable and productive, then tidal and wave energy and hydrogen technology. There needs to be political will though, to invest in technologies for the longer term. Our view and demand is always for instantaneous results, especially with spending in politics. Four to five year election cycles rule, and to invest in a real mix of technologies, including carbon capture but also the above, where the results might not come through for for 5-10 years would be considered worthless with the current suicidal mindset as it won’t hold capital in the current political term. So I feel we need to change our societal and political outlook massively before real moves towards reductions in emissions can be made. Yeah, as is the case in many other areas of science and technology, the biggest problem is that there’s insufficient public support for long-term projects that will not yield immediate financial gain. This leaves researchers looking to the private sector for funding, and corporations don’t have the capital to make very large, very risky, very long-term investments. That’s the problem, but we desperately need a way round. With COP21 approaching this year it looks to be a crucial test for ‘our’ leaders to see if they can enact any sort of agreement, however modest. It could be interesting to do some shared analysis on the run up and events at this years climate conferences if this thread is something you were thinking of pursuing.